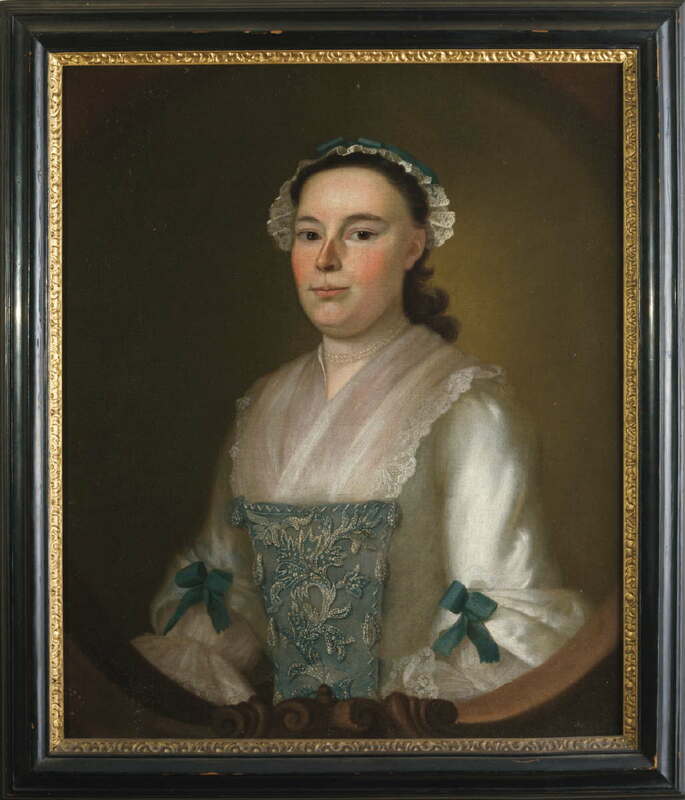 There is a lot to admire about eighteenth-century women in general; two that I admire in particular are Abigail Russell Curwen (1725-1793) and Mary Toppan Pickman (1744-1817), the wives of two of Salem’s most prominent Loyalists. In 1775 their husbands Samuel Curwen and Benjamin Pickman decamped for London, leaving both ladies behind to mind their considerable estates. Whether Mrs. Curwen and Mrs. Pickman were passionate Patriots we do not know, but one smoothed the way for her husband’s return after the Revolution, while the other did not. We are fortunate to have portraits of these two Salem ladies, painted by two of the best portrait painters on either side of the Atlantic. 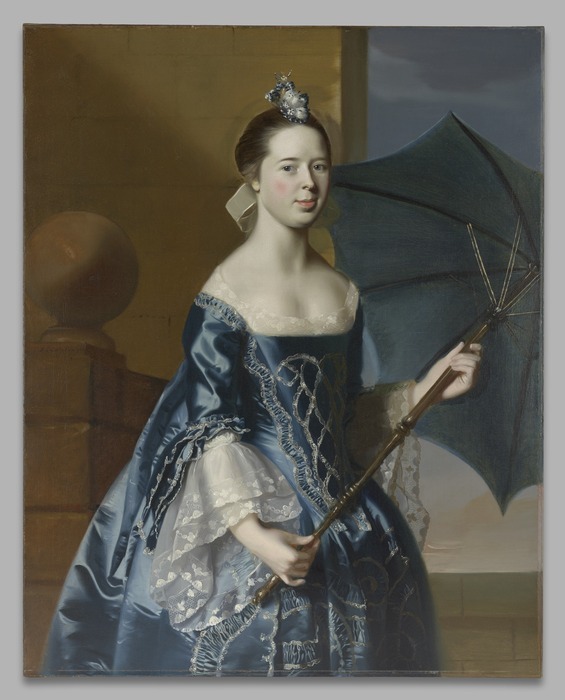 Abigail Russell Curwen, 1755: Joseph Blackburn (Northeast Auction’s March 2010 Americana Auction); Mary Toppan Pickman, 1763: John Singleton Copley (Yale University Art Gallery). These portraits were painted very shortly after their respective marriages; consequently they look a bit more carefree than I expect they would have appeared later in life–especially the parasol-bearing Mrs. Pickman! The Pickmans appear to have had a happy marriage even while he was away, but by all accounts the Curwens disliked each other intensely and were happiest on opposing sides of the Atlantic Ocean. After the Revolution was over, Pickman came right back to Salem and picked up (professionally–perhaps personally???) where he left off, but Curwen reluctantly returned and then fled right back to London, writing about his wife in his later-published Journal that “the Marriage shackle that unhappily linkt her to me is now to all intents and purposes broken”. It was not just his wife of which Curwen spoke ill: he was clearly a “miserable lout” (to use the words of one of my Americanist colleagues) and angry at the world; consequently he could not be reconciled to either his wife or Salem. By all accounts, Pickman was clearly a much more affable sort who was even referred to as “the agreeable Mr. Pickman” by John Adams, the ultimate Patriot. But this post is not about the men, it’s about the women, who assumed (or did not assume) ultimate responsibilities for their family’s fortunes and well-being during a time of apprehension and agitation. The Curwens had no children (unsurprisingly) and one of the reasons Samuel fled back to London was because he faced “ruin” at home, while the Pickmans had four children, a town house and a farm in South Salem, which Mary managed with her mother-in-law, Love Rawlins Pickman. Because of her “sacred” character, Mary was “admitted to all circles in Salem” during the war and after, and thus facilitated her husband’s return. After Abigail’s death in 1793, Samuel Curwen returned to Salem for a second time, and remained until his death in 1802. Benjamin Pickman’s letters to Mary (in the Phillips Library of the Peabody Essex Museum) continually testify to his “unfeigned love and esteem” for her and the pain of their separation (as well as that of America and Great Britain): upon his return they lived together for over thirty years, until her death in 1817. 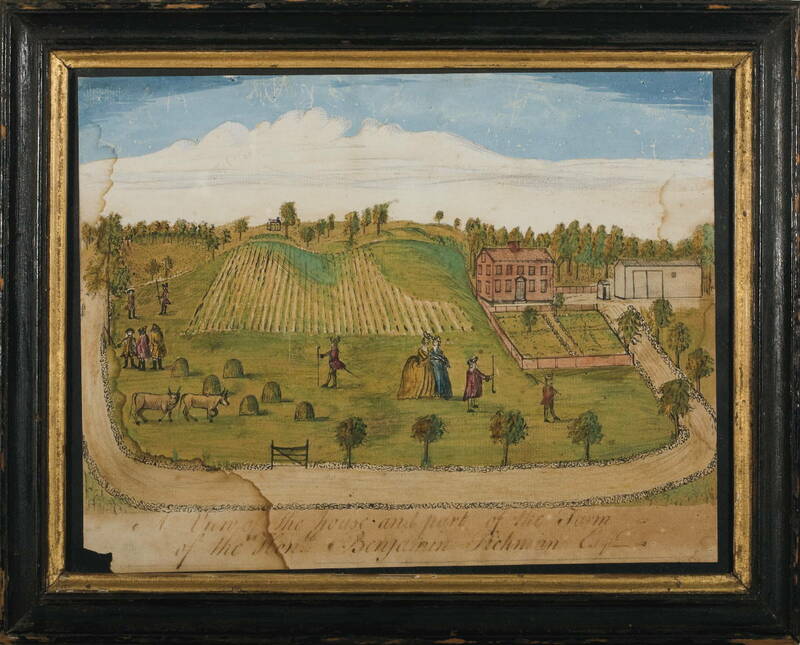 The Pickman Farm off the present-day Loring Avenue in South Salem: A VIEW OF THE HOUSE AND PART OF THE FARM OF THE HON’BLE BENJAMIN PICKMAN, ESQ., SALEM, MASSACHUSETTS, MID-LATE EIGHTEENTH CENTURY, Northeast Auctions. This entry was posted on Tuesday, December 3rd, 2013 at 6:58 am	and tagged with American Revolution, Art, Auctions and posted in History, Salem. You can follow any responses to this entry through the RSS 2.0 feed. I love the set-up of this post. Opening with the description of two women without revealing who had greater matrimonial/societal success led me to study the two pictures first in the hopes that they would reveal something about each woman’s character that would then allow me to guess their respective fates. Clearly, affability is a trait that transcends both types of success and I must say that Mrs. Pickman just comes across as more “approachable”; but the deck clearly was stacked against Mrs. Curwen, so who knows. Joseph Blackburn is so known for the Style and Poise of a Colonial American Portrait Painter. Thanks for mentioning Joseph Blackburn in your blog.